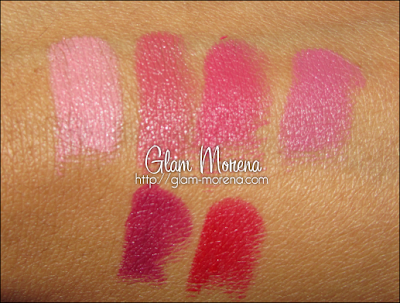 Glam Morena: Wet n Wild Mega Last Lipcolor. Wet n Wild Mega Last Lipcolor. I have some more shades of the Wet n Wild Mega Last Lipcolors to share with you. 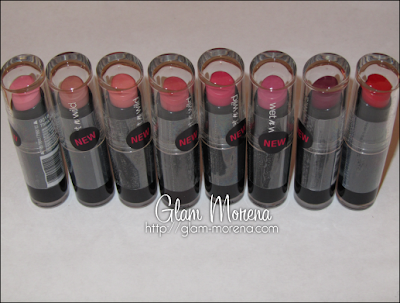 I've already reviewed the Mega Last Lipcolors and you can view that review here. There are six other shades that will be shown in this post. 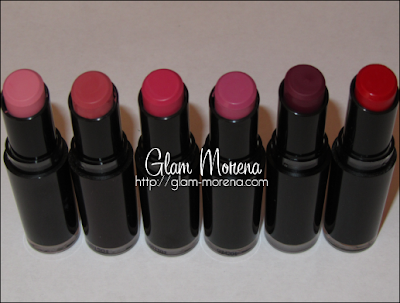 From left to right: Think Pink (901B), Rose-Bud (904B), Smokin' Hot Pink (905D), Mauve Outta Here (907C), Sugar Plum Fairy (908C), Stoplight Red (911D). 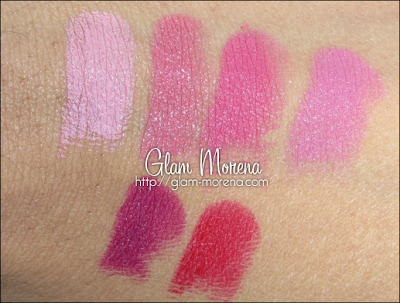 Now on to swatches of the Wet n Wild Mega Last Lipcolors! Have you tried any of these shades? Any Favorites? those are pretty! remind me of warm weather :) i've never tried wnw lipsticks before, but i'm not a very big lipstick girl either. I have ravin raisin have yet to do a look with it, all of these are very pretty not to mention affordable. I tried Just Peachy but it accentuated my lip lines and drier edges so I never tried Mega Last Lipcolors again. I think Rose Bud looks so good though, I may have to give the line one more chance! Stoplight Red is my fave. I love it! Thanks for this post! I have two and I love them but after seeing your swatches Im definitely going to try more.